The attached portrait is the work of Charles-Francois Phélippes (signed and dated 1839). Phélippes also produced the portrait of James Pradier (in 1834), in the collection of the musée de Genève. They appear to have been close, as can be noted on your website. I own this portrait since 1991, when I bought it as that of Clara Schumann (wife of the composer), based on Butterfields (Los Angeles) auction records of 1990. When I submitted it to a German auction house for consideration, their experts concluded it was not [her portrait]. Does this young lady look familiar? Thank you for your kind consideration and congratulations on your beautiful work. Please excuse this late response, due to a busy schedule and to technical problems with my new website. As you know, Clara Josephine Wieck, born in Leipzig on Sept. 13, 1819, was a child prodigy and was already a famous pianist when Phélippes painted this portrait in 1839. She had not yet married Robert Schumann and was on a concert tour in Paris that year, from January to August. Thus she was only 19 at the time and the young woman Phélippes portrayed looks to be about that age. His model also has some special interest in music, as suggested by the album open on her lap. The title below the engraving on the left-hand page of the album and the title above the score on the right-hand page may hold clues. Are they readable on the original painting? It's worth mentionning that Pradier himself composed and illustrated a number of Romances for piano and voice, several of which can be seen at the Music Department of the French National Library in Paris (cf. my edition of his Correspondance, vol. I, Illustrations, and p. 189, note 1). He also tried his hand at painting. 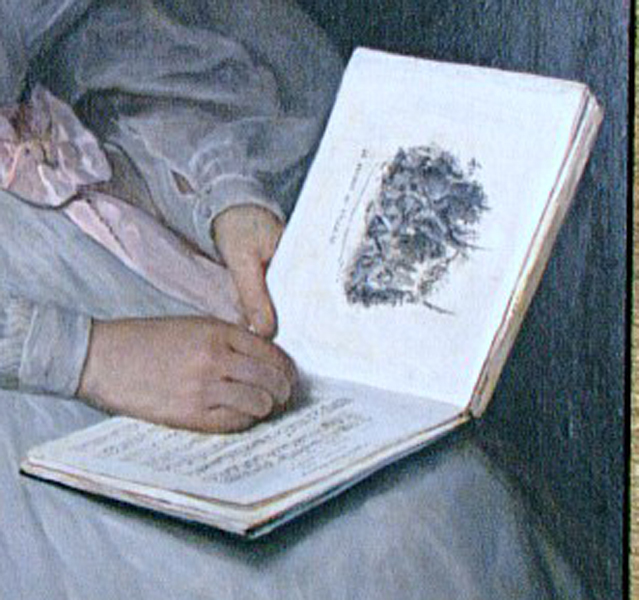 I find that his Portrait de Mlle A. V..., exhibited at the 1837 Paris Salon, presents certain affinities with Phélippes' canvas. Unfortunately, little seems to be known about Phélippes' life and works. I don't believe I have written about him elsewhere on this website but I did provide a few details in my notes to Pradier's Correspondance and in the notice I devoted to his portrait of Pradier in the 1985-1986 Pradier exhibition catalog, Statues de chair, pp. 350-351. This portrait is reproduced both in the Correspondance, vol. 2, and in the catalog. 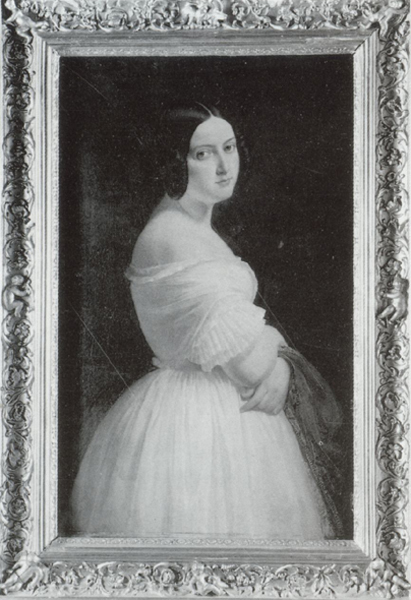 Phélippes exhibited it at the 1835 Salon along with a portrait of Pradier's wife Louise, unlisted in the Salon catalog and presently lost. The two artists do seem to have been very close. Phélippes signed as a witness the birth registry entries for Pradier's daughter Charlotte, born in 1834, and for his son John, born in 1836. In a document written near the end of 1844, Pradier includes him in a list of the most frequent visitors to his home on the quai Voltaire (see Correspondance, vol. 3, p. 113). In 1852 he signed the mourners register at Pradier's funeral. A student of Louis David, he exhibited his works at the Paris Salon starting in 1833 (none listed in 1839; a Portrait of M. L..., sous-intendant militaire and a Portrait de Mlle Léonie P... in 1840; none listed in 1841; a Portrait de Mme T. de L... in 1842; etc.). He left posthumous portraits (after the originals by Albert Gregorius) of king Louis-Philippe's brothers, Antoine-Philippe d'Orléans, duc de Montpensier (1775-1807), and Louis-Charles-Alphonse Léodgard d'Orléans, comte de Beaujolais (1779-1808), both at the Musée de Versailles. The engraver Charles Meryon (1821-1868), greatly admired by Baudelaire, was his pupil. The birth registry entry for Charlotte Pradier in 1834 states that he was 44 at the time she was born, which situates his year of birth around 1790, the same year as Pradier. His year of death is reported to be 1867. Have you considered submitting your painting for evaluation and identification to the Archive and Research Center at the Robert Schumann House in Zwickau, Germany? According to the center's website at www.schumannzwickau.de, it houses the world's largest Schumann collection, including a substantial picture collection, and is « the place to go for academics and researchers from all over the world », offering « unique opportunities for biographical and musicological research into this artistic couple and their contemporaries ». You could also contact the Robert and Clara Schumann Society in Liepzig. In Paris the Musée de la vie romantique might also be able to help. It is very kind of you to reply to my querry and offer your assessment. [Information on the] provenance of this work has suffered from effects of time I allowed to pass, convinced it represented Clara Schumann. My research of Schumann diaries (Berthold Litzmann) seemed to confirm authenticity: dates, references seemed to fit. Visual comparison was lacking, but I did contact the Schumannhaus and receive inconclusive and skeptical feedback (they had reservations about pieces in their own collection). Butterfields (now Bonhams) is not cooperating and understandably cites time lapse and client privilege. I have had better reactions from experts like yourself. M. Xavier Dufestel has offered to look into this mystery. A 19th-century frame expert concluded the frame was created for this portrait and similar to some holding works commissioned by Louis-Philippe. The note book the subject holds is titled Le séjour au village, a song, presumably composed by Panseron, indicating a musical connection, but I find no personal connection between them. Any suggestions on how to obtain images of the two portraits you mention, Mlle Léonie P... and Mme T. de L... Phélippes showed in 1840 and 1842 ? As I suspected, the music album your young lady is holding on her lap does provide useful information. For like Phélippes, the composer and voice teacher Auguste Panseron (1795-1859) was a close friend of Pradier. Pradier even made a marble bust of his wife (cat. Claude Lapaire, p. 423, n° 459). Thus it is very likely that Phélippes and Panseron knew each other, which points to the possibility that the young woman may indeed have had some connection with the composer. Since receiving your last message I have searched the internet and my own files in hopes of finding further clues. 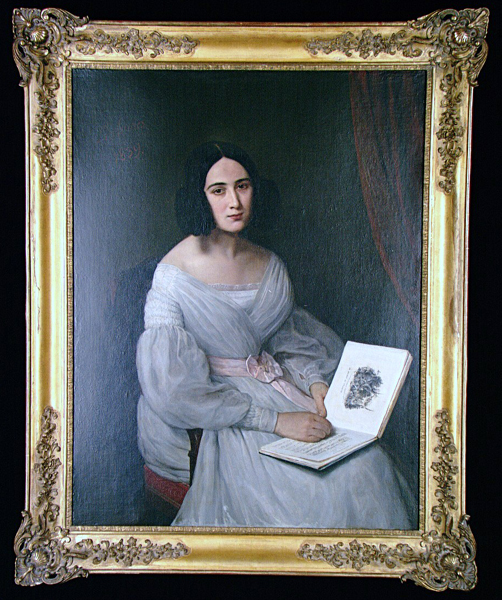 I was able to determine that Panseron had at least one child and I am wondering if the Mlle Léonie P... in the portrait which Phélippes sent to the 1840 Salon could be Léonie Panseron. I have not been able to find an image of that portrait (nor of the portrait of Mme T de L...) but one of the contemporary accounts of the Salon may have given a brief description of it. In any case it might be worthwhile for you to check the birth records in the Paris Municipal Archives to see if Panseron did have a daughter named Léonie. Years ago I saw in the Music Department of the National French Library (ref. II. 65,904 A Mus. ), an undated album containing twelve songs composed by Panseron, each with an engraving by Marie-Alexandre Alophe, known as Menut, who was also one of Pradier's close friends and who engraved his portrait in 1838 (reproduced in my edition of Pradier's Correspondance, vol. 2). This is perhaps the album in your painting. Unfortunately I didn't make a note of the titles of the songs but it would be easy enough to check to see if one of them corresponds to the one in your painting. Incidentally, I believe that title must be Le retour au village, one of Panseron's known compositions, and not Le séjour au village. Can you verify this please? As I mentioned in my first reply above, the 1839 and 1841 Salon catalogs do not list any works by Phélippes. 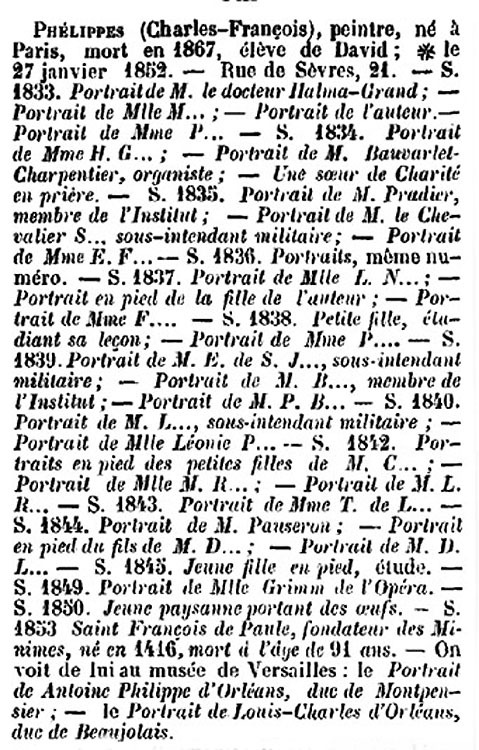 However, the Dictionnaire général des artistes de l'école française by Émile Bellier de la Chavignerie and Louis Auvray does list three dated 1839: Portrait de M. E. de S.J..., sous-intendant militaire;  Portrait de M. B..., membre de l'Institut;  Portrait de M. P.B.... Unfortunately these are all men! 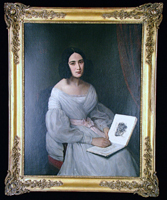 No works are listed for 1841 and the Portrait de Mme T. de L... is dated 1843. A few other female portraits are listed after that date (click here to see the complete list) but they are probably irrelevant to your painting. 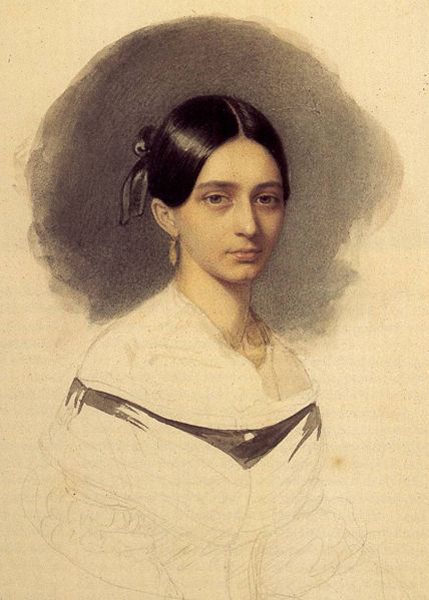 With regard to Clara Schumann, the question arises as to by whom and under what circumstances a portrait of her would have been commissioned in 1839. She was apparently on tour alone, traveling for the first time without her father. 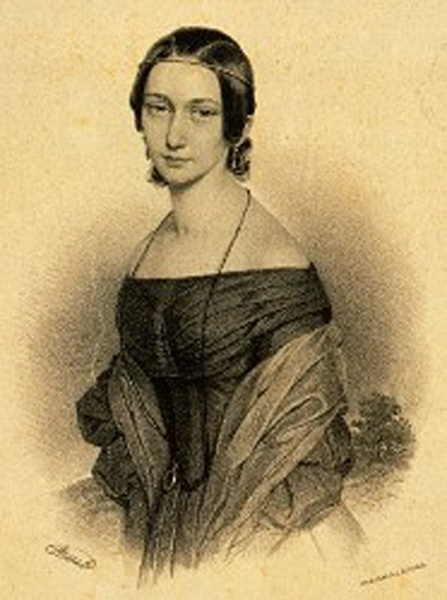 Berlioz writes about her in a letter to Robert Schumann dated 14 February 1839: « Mlle Clara Wieck est arrivée, je viens de parler d'elle dans la Gazette Musicale; je n'oublierai pas votre recommandation pour le Journal des Débats. Comptez sur moi. Quand M. Heller pourra me présenter la charmante victuose je lui demanderai de me faire entendre quelques unes de vos compositions. On dit que c'est un talent merveilleux. » (Hector Berlioz, Correspondance générale, edited by Pierre Citron, Flammarion, 1972-, vol. 2, p. 533). In his correspondence with Robert Schumann (at least in the few letters which survived WW II), the composer and pianist Stephen Heller (1813-1888) doesn't mention her 1839 stay in Paris (Stephen Heller, Lettres d'un musicien romantique à Paris, presented and annotated by Jean-Jacques Eigeldinger, Flammarion, 1981). Nor does Pradier mention her in his known correspondence, though being a music lover he could have heard her perform and introduced her to his friends Phélippes and Panseron. Please note auction information for the sale of my painting: Neumeister Auktionen, Munchen, March 27, 2013, Alte Kunst A359, Lot n° 622. Your input was very helpful in my research. Thank you. Phélippes, Charles François (geb. in Paris, gest. 1867, stellte 1833-1853 im Pariser Salon aus) Bildnis einer jungen Sängerin (Léonie Panseron?) Dreiviertelfigur nach rechts sitzend. In den Händen einen aufgeschlagenen Notenband haltend. L. o. signiert und 1839 datiert. Öl auf Lwd. 116 x 89,5 cm. Doubliert. Rest. Min. besch. - Rahmen d. Zt. min. besch. Die zweistimmige Komposition "Le séjour au village" im Notenband lässt sich als Werk des seinerzeit bekannten und auch international geschätzten französischen Musikers und Komponisten Auguste-Mathieu Panseron (1796-1859) identifizieren. Sammelbände in der vorliegenden Art, mit Illustrationen von der Hand des Künstlers Marie-Alexandre Alophe, sind aus Panserons Schaffen bekannt. Durch eine in der New York Public Library for the Performing Arts / Music Division aufbewahrte Lithographie ist bekannt, dass Panseron mit seiner Frau eine Tochter hatte. Im Jahre 1840 stellte Charles François Phélippes auf dem Pariser Salon ein "Portrait de Mlle Léonie P..." aus. Möglicherweise handelte es sich dabei um vorliegendes Gemälde und die Dargestellte wäre mithin als "Léonie Panseron" zu identifizieren, in den Händen einen Band mit Kompositionen ihres Vaters haltend. Eine Sängerin "Mme Panseron" war nachweislich noch 1879 im Théâtre de la Renaissance in Paris engagiert. This description is largely based on the information I provided to M. Gajic, although the exact title inscribed on the music album (Le séjour au village or Le retour au village?) remains to be verified.